The police officer (Darren Wilson), whether it is determined to be a good shoot or not, has pretty much had his life thrown in the blender. He's had to bug out from his home, take the family and into hiding while the shooting is investigated. He's been the target of hacking attacks, had personal info dumped onto the 'web and received who knows how many death threats. If at the end of this, he's cleared of wrong doing, he'll still have to live his life as a pariah. A private citizen could face similar circumstances (see: Zimmerman), and without whatever protection/resources available to a police officer in a situation like this. Your name and info would be out in the media within hours. You'd potentially be in police custody while your family freaks out at home. "Kids"? Matching red a coincidence? 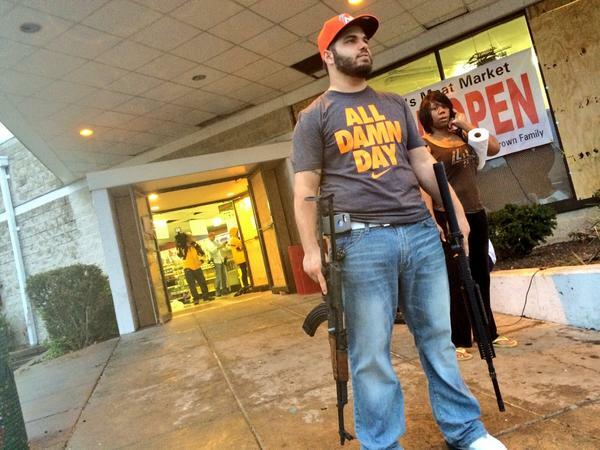 While we've seen store owners standing guard over their businesses with ARs and AKs in hand (or both, in this guy's case), more have left their businesses to be looted, trashed and burned. Your initial reaction might be to question why these shop owners wouldn't take up arms like the others to protect their businesses and livelihood? But, take a step back. If you were to shoot a looter or two trying to loot your store, how quickly might you find yourself the target of violent backlash and legal action? Violence against you and your family, potential jail time (state laws vary wildly on using force to protect property), thousands in legal fees...not pretty. Naa, that's is why you get good insurance. Shut it down, board it up, take pictures of your inventory/equipment and set up some web cams. Call the cops if/when the looters start smashing and grabbing. Record the call, just in case. If there's no threat to your life or the safety of customers...let 'em torch the place. Then, the insurance company will cut you a check and you can set up shop somewhere safer and less riot prone...Avoid the potential violence, threats, legal entanglement, and get paid to relocate elsewhere. Smart move. Finally, if you've got friends/family who are (still) oblivious to how quickly the thin veneer of law & order can fracture, here's (another) wake up call. Not two or three weeks ago, my wife and I had a long chat with a friend about prepping, gun ownership, etc. A good chunk of that was talking about what happened post-Katrina--the rampant looting, lawlessness and general lack of police intervention for many days afterwards--as an example of what has happened in the U.S. in recent history. That seemed to be news to her. Many people are just too busy working and raising their families to pay a whole lot of attention to what's happening elsewhere. A well timed nudge can be helpful. Now it's your turn--have the current events caused you to re-think any of your plans or change priorities?